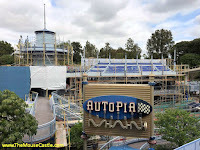 The Autopia, currently being refurbished. When the Autopia reopens at Disneyland on April 30, it will have a new sponsor. Honda announced Tuesday that it will take over sponsorship of the classic Tomorrowland attraction. The Autopia will be updated with a new look and storyline and all the vehicles will be "Honda powered." No word on whether that means the cars will be electric like they are at the Autopia in Hong Kong Disneyland, which is also sponsored by Honda. In a statement, American Honda Motor Co., Inc. president and CEO Takuji Yamada said, "Autopia has brought joy to generations of families and has created lasting memories for millions of Disneyland guests, Honda is proud to sponsor this iconic attraction and continue our alliance with Disneyland Resort." This will be the latest of several Disneyland sponsorships by the automotive company dating back to 2005. Honda has previously sponsored fireworks shows, Grad Nites and an ASIMO exhibit at Innoventions. 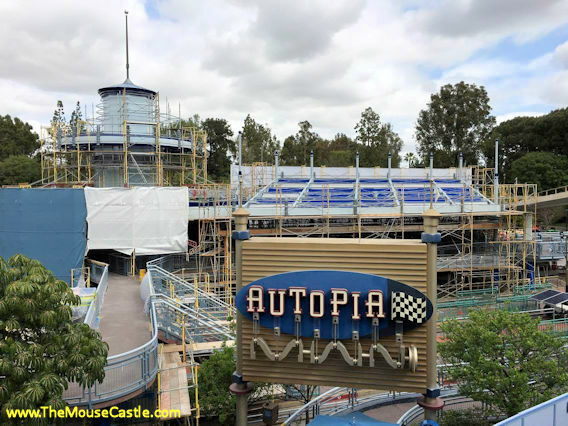 The Autopia has been closed for refurbishment at Disneyland since January.